As you may recall from previous years, living things show a series of characteristics: nutrition, interaction and reproduction. Nutrition we have studied in more detail in the previous unit, reproduction will be looked at in the next unit, and now we are going to study in more detail how organisms interact and relate to the environment. All living organisms show irritability or sensitivity which is the ability organisms have to detect changes in their internal or external environment, and respond to them. Usually, these responses involve movement. There are two systems working together to direct and regulate all of the different body functions: the nervous system and the endocrine system. 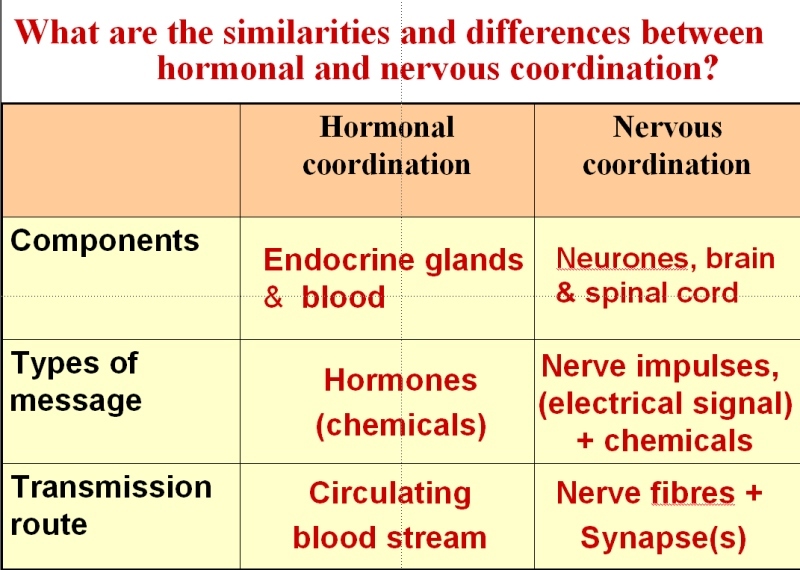 Coordination in humans (in all mammals) is achieved through two systems, each with its own particular role. The nervous system deals with rapid but short-lasting responses, whereas the endocrine system brings about slower, longer lasting responses. 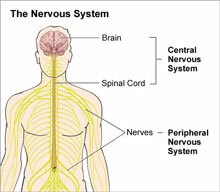 The central nervous system (CNS), which consists of the brain and the spinal cord, connected to the various parts of the body by the peripheral nervous system (PNS), made up of nerves. Review animation. Click here and use the menu below. The CNS (rain and spinal cord) is the processing unit. It integrates the working of receptors and effectors to bring about the appropriate responses. It controls our voluntary and many of our involuntary actions. It also carries out other important functions as it carries out intellectual and mental processes and transmits emotions and feelings. The PNS sends information to the CNS from internal organs or from external stimuli. There are two types of cells in the peripheral nervous system. These cells carry information to (sensory nervous cells) and from (motor nervous cells) the central nervous system (CNS). But, how does the information flow? How is the information registered, processed and delivered so the body can carry out the proper response? A receptor detects a change in conditions (stimulus). A message is carried from the receptor to the CNS (the processing unit) by a sensory neurone. After processing, a message is sent from the CNS to an organ (an effector) that carries out a response. A motor neurone carries this message. Neurones (or nerve cells) are the most specialised cells in humans. All the information carried by the nervous system travels along this specialised cells. The structure of a neuron and the way is adapted to its function is shown below. Cell body: controls the metabolism of the nerve cell. Dendrites: The dendrites connect one neuron with the next. Here the impulse enters the cell. 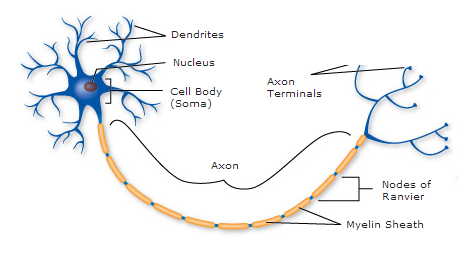 Axon: The axon is a long fiber with small branches at the end which carries information away from the cell body (so where the information leaves the cell). Nodes of ranvier: The nodes of ranvier amplify the speed of the impulse along the axon. They are situated between the myelin sheaths). 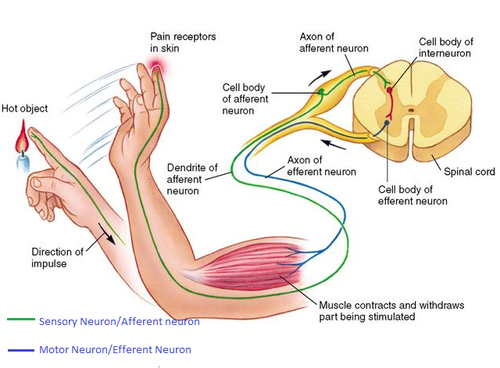 Sensory neurons: they transmit electrical signals from receptors to the central nervous system. Motor neurons: they transmit electrical signals from the CNS to effectors. 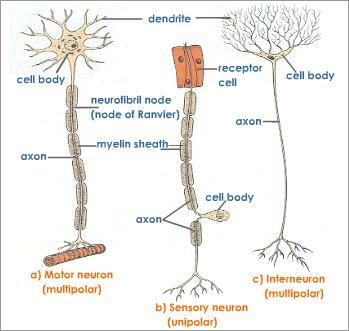 Relay neurons (interneurons): They connect the sensory neurons with motor neurons and are located in the CNS. Make sure you know the direction of the impulse starting with the dendrites and ending at the end plates (synaptic knob). Messages pass along neurones in the form of electrical impulses. These impulses travel very quickly from one end of a nerve cell to the other. Between the end of an endplate of one neuron and the start of a dendrite of the next there is a gap called the synapse. An impulse arrives at the synapse. At the end of the axon (or endplate) there are tiny sacs containing a chemical (neurotransmitter) which is released into the gap. The chemical diffuses across the gap passing the information of one neurone to the other. So, let’s try to understand the pathway of the impulse: Your senses detect changes in the environment, they are received and passed on to the CNS by sensory neurones where they are processed. The sensory neurones are connected to the motor neurones by interneurones. The motor neurones send the instructions from the CNS to effectors (organs, glands and muscles). The spinal cord, which runs down the neck and back inside the vertebral column receives information from the skin and muscles and sends out motor commands for movements. It produces reflex actions (rapid automatic response to stimulus in which the brain is not involved. All reflex actions are to protect the body from possibly dangerous situations, to help us survive). It carries sensory signals from the senses to the brain and motor signals from the brain to effectors. Below is an example of how a reflex action works.